The mechanical parts of King Dedede's hammer can be seen when using or charging this special move. This article is about King Dedede's down special move, Jet Hammer. For other uses of "Hammer", see Hammer (disambiguation). 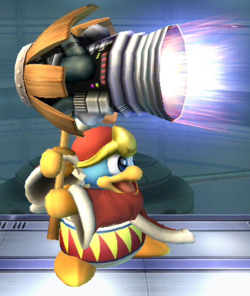 Jet Hammer (ジェットハンマー, Jet Hammer) is King Dedede's down special move. If the player holds down the control stick and the special-move button simultaneously, they can charge up his hammer. The player can even walk around and jump while the hammer is being charged, but they can't save the charge and cannot cancel the move, unlike most other charging moves. Once it reaches full charge, the player can hold the charge indefinitely, but it will cause one percent of damage to King Dedede every second until the player releases the attack. However, once Dedede's damage is high enough, damage from holding a fully charged Jet Hammer will no longer occur. Dedede charging Jet Hammer in Brawl. Fully charged, the hammer deals massive damage and knockback, and the last few stages before fully charged deal even more knockback. However, despite its extreme power potential, Jet Hammer is considered Dedede's worst move in Brawl and is barely ever used in competitive play, with it having almost no practical use. Jet Hammer charges up slowly, and requires considerable amounts of charging before it reaches power levels beyond Dedede's other KO moves (which can all be completed before Jet Hammer charges enough to reach their power). While Dedede can move and jump around while charging Jet Hammer, he moves and jumps too slowly for it to make it useful, and any opponent can easily outmaneuver a Dedede charging Jet Hammer. Additionally, Jet Hammer has poor reach and surprisingly small hitboxes, which when combined with the aforementioned very slow movement and long charging time, makes it incredibly difficult to land the move on an opponent that isn't incapacitated. Since it has high ending lag and cannot be cancelled, with the aforementioned movement and reach issues, along with it having transcendent priority and no armor whatsoever, Dedede is completely defenseless when using the move, giving opponents a free punish if Dedede tries to use the move while they're not incapacitated. The final nail in the coffin is that while Jet Hammer can be incredibly powerful, fully charged it's still not as powerful as Dedede's uncharged forward smash and pales in comparison to a charged forward smash. Additionally, while Dedede's forward smash has extremely long start-up lag, it'll still come out well before Jet Hammer reaches near fully charged, and unlike Jet Hammer, it has massive reach and rather low ending lag, along with a quake hitbox that extends its reach farther, making the move much less punishable and actually more landable. As such, whether it be capitalising on an incapacitated opponent or trying to go for an especially early KO, Jet Hammer is obsolete to Dedede's forward smash, and the other mentioned issues keep it from being any sort of weaker but more reliable KO move. There is a glitch that increases the effectiveness of this move by allowing King Dedede to skid across the stage at incredible speeds while charging it. This is done tilting the control stick in either left or right direction just barely enough to allow Dedede to move. If done properly, Dedede will continuously take only the first step in his walking animation and move across the ground at an incredible speed, which can be seen here. However, the extreme precision this requires to maintain beyond a split second makes it beyond the technical ability of human players, and leaves it as something only seen in tool-assisted demonstrations. Unlike other chargeable moves like Eruption, Jet Hammer's damage does not increase in stages, but rather in a continuous fashion which includes decimal percentages. As such, the below table states general kill percents at different levels of charge in Brawl, and is not an exact guide. Like most chargeable moves, the fully charged state is not the most powerful; however, it does deal the most damage. Dedede approaching Fox with Jet Hammer in Smash 4. Jet Hammer returns as King Dedede's down special. It has been heavily buffed from Brawl, where it now has much greater range, a much larger hitbox, and the full charge is more damaging on the ground, dealing up to 38% damage, and can KO below 50% when near stage edges (though it still deals less knockback overall than the weaker charge levels, due to having only 5 BKB and 66 KBG). The full charge also deals high shield damage, despite lacking a shield damage bonus. Additionally, overcharging the move now stops damaging Dedede at 100% instead of 150%, and an overcharged strike is capable of hitting any ledge-hanging opponent, giving it a new use as an edgeguard, especially due to SSB4's new ledge mechanics. Visually, the lighting emanating from it is much more intense, noticeably lighting up the surrounding areas, and now has sparks ejecting from the hammer. It also produces wind visuals. When charging the move, Dedede now has a grimacing facial expression and can be seen visibly sweating. "You charge it while walking around, but charge it for too long and you'll take damage." "Charging gives you super armor, but charging fully hurts you more. Also deals less damage." "Pushes you backward while charging, and sends you dashing forward when you attack." 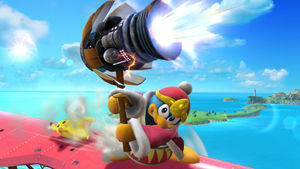 Armored Jet Hammer: Dedede gains super armor, in exchange for taking damage faster while doing so. It is far less effective at KOing, however, as the move has massively reduced damage and knockback, with a fully charged swing being incapable of KOing most fighters until around 150%, which an uncharged swing from the default Jet Hammer can do reliably. The ending lag is also drastically increased, to the point where if Dedede were to swing the hammer while right under the upper blast line of Battlefield, he would not be able to move until landing back on the main platform. As a result of these flaws, this attack's overall usage is heavily impractical when compared to the other Jet Hammer variants. On a side note, a glitch exists, where Dedede does not get any super armor at all while falling, even though the SpecialLwFall_C2 command suggests that he does. 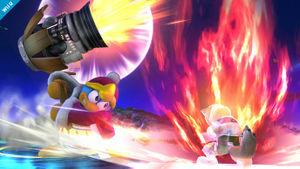 Dash Jet Hammer: The attack sends Dedede forward, but pushes him backward while at full charge. Deals much less damage and noticeably less knockback, though the knockback is still much better than that of Armored Jet Hammer's. In some games, starting with Kirby Super Star, Kirby can perform a similar move, the Hammer Flip, when in possession of the Hammer copy ability: it consists in charging the hammer, then releasing it with a fiery upward swing. Later games, released after Brawl, made the Hammer Flip available to King Dedede himself in his playable appearances. The jet engine inside the hammer is a Smash Bros. exclusive feature; however, King Dedede's Masked Dedede persona in Kirby Super Star Ultra (released eight months after Brawl) wields a new, electrified mechanical mallet which can shoot missiles and spew fire. Jet Hammer being held at full charge in Brawl. Jet Hammer being released before reaching full charge in Brawl. Released at full charge in Brawl. A closeup of Dedede's face during Jet Hammer in Smash 4, which more clearly shows the new lighting and sweating effects . Dedede approaching Lucario from behind with Jet Hammer in Smash 4. Jet Hammer as shown by a Skill Preview in Ultimate. When the game is slowed down in Brawl, it can be clearly seen that the top end of the hammer disappears before the jet pops out. This page was last edited on March 10, 2019, at 16:58.